Your vehicle’s exhaust system consists of four main parts: the oxygen sensors, the tailpipe, the catalytic converter, and the muffler. As a system, it connects to the engine at the front, carries the gases down to the bottom of the vehicle, and runs along the bottom to the rear. The exhaust system has two main functions. It converts harmful gasses from the engine into gases that are less harmful before releasing them into the atmosphere, and quiets the noise your vehicle emits. A properly functioning exhaust system carries the gases your vehicle emits safely away from the vehicle. Exhaust systems need regular maintenance, and you can tell that the system needs to be worked on if the vehicle makes extremely loud noises, or if it smells like sulfur and has releases a cloud of smoke behind it. Holes, fallen or dragging parts, or disconnected pieces can all lead to issues with an exhaust system. In some cases, exhaust problems can cause poor gas mileage, in addition to other driving challenges. 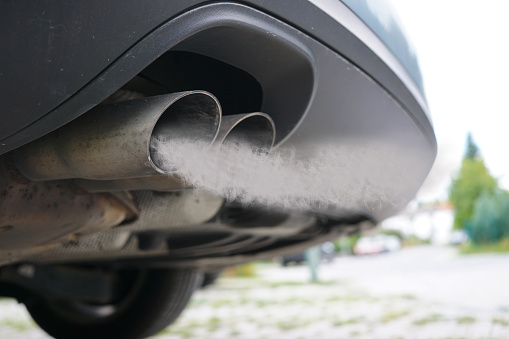 Issues with the exhaust may not immediately affect the functions of the vehicle, but can be very unhealthy for you, the people, plants, and animals in your community, and the atmosphere as a whole because of the unsafe gases released. If left unchecked, they can lead to bigger issues, including the buildup of unsafe gases in and around your vehicle. Rust is a big enemy of the exhaust system Those in colder climates, especially with heavy snow or rain, may need to check on their exhaust systems more often. Things like rocks or salt can wear on the underbelly of your vehicle from everyday driving. However, exhaust systems can also be damaged in a collision, especially one from behind. If you’ve been in a collision, the damage to your exhaust system may be obvious if you check the back or underside of your vehicle. Whether you have been in a collision or not, if you notice any of the following symptoms, you should have your exhaust system inspected, and it may need to be repaired. – A cloud of smoke is emitted from under or behind your vehicle. If you have questions or concerns about your vehicle and whether its systems are functioning correctly, many collision shops will inspect it at little to no cost to you. When the safety and health of you and your loved ones could be at stake, it’s always better to have an expert check it out.